The Trump regime launched an old-fashioned coup d’etat attempt to gain another imperial trophy – what it’s done scores of times before since the 19th century. Key for the US is controlling what it’s coveted since Hugo Chavez’s election 20 years ago – control of Venezuela’s vast oil reserves, the world’s largest. The Trump regime wants Venezuelan reserves controlled by Big Oil, likely willing to do whatever it takes to achieve its aim, military intervention an option if other tactics in play fail. New millennium resource wars are raging in the Middle East, as well as other oil and other commodity-rich parts of the world – a modern-day super-high stakes great game. The same goes for Venezuela and other oil-rich states, mainly Russia, a nation of vast hydrocarbon and other highly valued resources, including timber, iron ore, copper, diamonds, lead, zinc, bauxite, nickel, tin, mercury, gold, silver, manganese, chromium, platinum, titanium, tungsten, and phosphates – a strategic prize the US covets. Its strategy for unchallenged global dominance involves controlling energy resources, other high-value commodities, food to control people, and money to control everything – controlling the world depends on it. The Trump regime called a Security Council session on Venezuela, strong-arming enough SC members to agree on holding it – including Britain, France, Germany, Belgium, the Dominican Republic, Kuwait, Peru and Poland. Against the session were China, Russia, South Africa, and Equatorial Guinea. Indonesia and Ivory Coast abstained. Operating as an imperial tool, UN Secretary-General Antonio Guterres failed to condemn the US coup attempt in Venezuela. So did a UN press statement, citing a political crisis, the country “buckling under severe shortages” – saying nothing about US responsibility for what’s going on, waging political, economic, financial, and sanctions war on the country, flagrantly breaching the UN Charter and other international law, what the world body is supposed to speak out against. The two-day session ending Saturday had nothing to do with gaining UNSC support for regime change in Venezuela, Sino/Russian veto power able to block the attempt. The session was all about Trump regime grandstanding on the world stage, pretending its coup attempt is the right thing to do – ignoring international and US constitutional law, along with sovereign Venezuelan rights. Pompeo represented imperial America at the session, his remarks hostile to the rights and welfare of the Venezuelan people he and other Trump regime hardliners pretend to support – faking it. “The United States is trying to initiate a coup d’etat in Venezuela” – a flagrant breach of international law and the country’s sovereignty. They stand with Maduro and Bolivarian social democracy against Washington’s regime change agenda. “The cynical, overt interference in the internal affairs of a sovereign state continues. 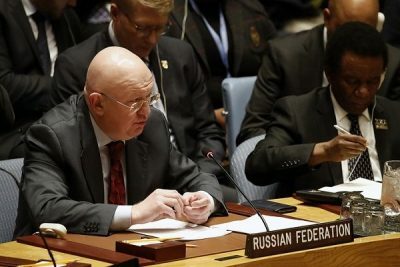 It is necessary to put an end to this,” Nebenzia stressed. US “interference into the internal affairs of other states is nothing new…treat(ing) Latin America (and everywhere else worldwide) as its backyard with no regard to the interests of people living there” – believing it’s the “warden of the Western hemisphere” and planet earth. US vassal states in Europe now demand if he doesn’t agree to a snap election rerun in eight days, they’ll recognize Guido as an interim president, an illegitimate one – backing the attempted coup over fundamental international law. It’s an embarrassment to be an American, a gangster state run by its criminal class, at war on humanity at home and abroad, its agenda threatening everyone everywhere.